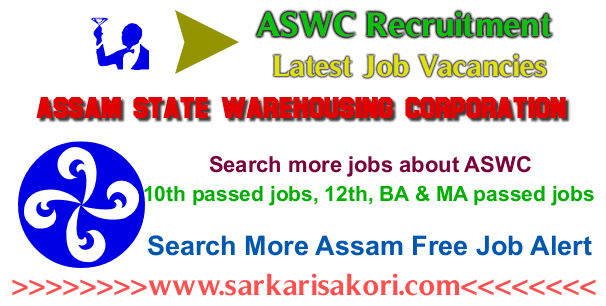 Assam State Warehousing Corporation Recruitment 2018 notification about for filling up follwing Technical Assistant & Warehouse Manager jobs under ASWC on Adhoc basis. No of posts: 06 Nos. (c) The candidates must also possess a minimum of 6 months Diploma/Certificate in Computer proficiency from a Govt. recognized Institute. No of posts: 05 Nos. Application Fee: A Non-Refundable Demand Draft of Rs.500/- for General candidates and 250/- for SC/ST/OBC candidates should be paid through Demand draft in favour of “Assam State Warehousing Corporation” payable at Guwahati in any branch of Nationalized/Scheduled Bank. Interested and eligible candidates may apply in the prescribed application format may be downloaded from the official website www.warehouseassam.com (which are available below) along with self attested doccuments of HSLC Admit Card, Pass Certificate & Mark sheet, HSSLC pass Certificate & Mark sheet and Degree Passed Certificate and Mark sheet , PRC, Caste Certificate, Employment Exchange Registration Card up-to-date, a Diploma with minimum 6(six) months in computer application/ knowledge from a Govt. recognized institute and two copies of recent passport size photographs should be reached the following given address through Speed Post or by hand within time. ''To The Managing Director, Assam State Warehousing Corporation, Pannyagar Bhawan, Amarawati Path, Christian Basti, Guwahati, Pin-781005, Assam.''. Note: The selection Committee shall select the candidates for the post of Technical Assistant (Adhoc). Candidature of candidates is provisional and the Committee has the right to accept or reject the candidature of any candidates at any stage of recruitment after proper - scrutiny of the documents/testimonials. Candidates will be called for the written test and Interview after scrutiny of the applications received. Warehouse Manager Gr-II Application form. You will be interested more jobs about Assam State Warehousing Corporation Recruitment 2018, ASWC Recruitment 2018.